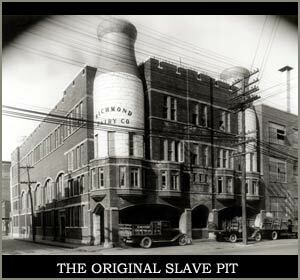 Some twenty or so years ago, the concept of the Slave Pit began with a group of aspiring artists and musicians located in Richmond, VA. Inspired by the examples of Spartacus and Monty Python, they sought to make their twisted visions an entertainment reality. In the pursuit of this goal they had birthed "The Slave Pit", a sprawling studio space located deep within the bowels of the Richmond Dairy. This hulking structure had been abandoned for years and inevitably had been taken over by a sub-populace of freaks and violent rednecks. Here the original Slave Pit collided with the music and madness that surrounded it. A bizarre synthesis of widely divurgent personalities created something that was called...and woe to those who say this name...something that will always be called...GWAR. But what the hell is the Slave Pit? It started as a physical place but was always an idea. So what is that idea? That reality is something that you build.